Top each slice of the multi-grain bread with cucumber, onions and cheese. Toast for about two to three minutes in the toaster oven or in a broiler. Top sandwich with sliced avocado. In a small bowl, mix Maille and honey. 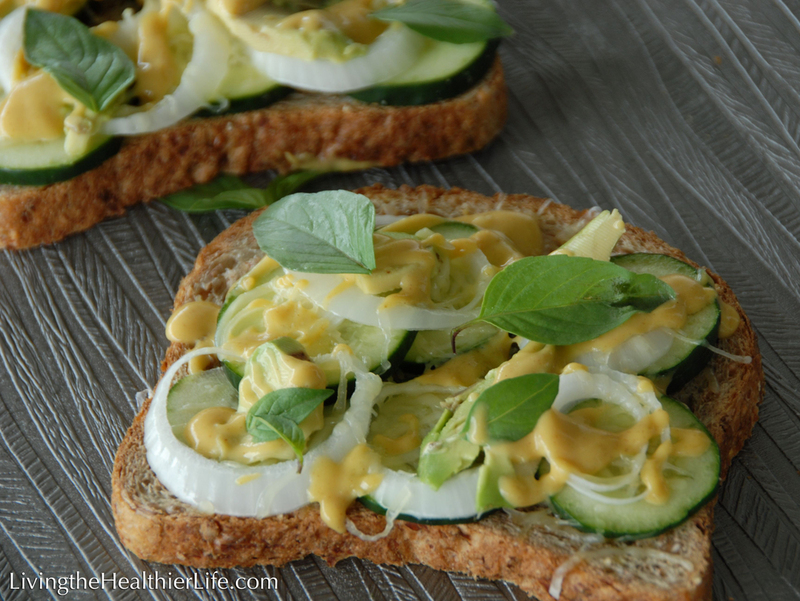 Drizzle honey dijon dressing on top of the sandwich slices. I topped my sandwich with fresh basil leaves. It gave it a bit of depth but isn't a necessary part of the recipe. 50% of the fat in this recipe comes from avocado. If you are watching your fat intake, omitting the avocado will result in a calorie reduction of 69 calories and 7 grams of fat. While I was putting together my newest veggie sandwich I was thinking to myself "what should I call this?" By the end of the lunch, as tears were running down my cheek, the answer came to me - Make You Wanna Cry Veggie Sandwich. The dressing I used is a delicious honey dijon. The base is Maille Dijon Mustard. For anyone who likes dijon mustard, you know that Maille is not for the weak of heart. And actually, whenever I have sinus problems, I eat a teaspoon of Maille and I am better instantly. Yep... that good (and strong). Of course if you prefer your dijon a little on the softer size, feel free to swap out the Maille for your favorite dijon.